CONNECT AND LEARN FROM SOME OF THE MOST INNOVATIVE INFLUENCERS IN AR/VR, MARKETING, SOCIAL MEDIA, FILM/TV, TECHNOLOGY, AND MORE! IR EN VIVO! ( In Spanish - Going Live!) Summit is a live stream summit bringing together social media influencers and innovators to share and celebrate the next big technologies fueling the future of influencer marketing, video, film, and more! Join us for one day of killer keynotes, panels, and networking with peers, influencers, and industry leaders who are shaking up the game. We’ve carefully crafted an incredible lineup of presenters who are prepared to arm you with new strategies, insights and know-how to take your business to the next level! Invite Only. Want In? Request a invite below. Grab your name tag and a seat. Learn how augmented and virtual reality is changing the scope of travel, film, beauty, and other industries. Will this impact your industry and the Latino community? Let's take a look of the next hottest trend of 2018! Special Video and Meet Pierre! Keynote Speaker: Stephen Marinaro aka "The Salon Guy"
through social media to where he has grown one of the largest professional hair channels on YouTube with over 70 million views, 460k+ subscribers and over 2 million viewers a month. Stephen is will share with you his knowledge on creating a brand, finding your passion, and turning it into a profitable business. VIP Meet & Greet (includes light breakfast). Invite Only. Jeongwoon Eun – Host & Founder, IR EN VIVO Summit! The Importance Of Social Media Resources To Help Victims Of Natural Disasters with George Torres and Chef Ronaldo Linares. How To Break Into Film/TV in 2017. Keynote: Building A Brand Through Media With Stephen Mariano Aka "The Salon Guy"
From Zero To 100,000+ Subscribers. Tell Me A Story: Ways To Use Storytelling To Grow Your Audience & Sales. Important Times Of Innovation & Biggest Trends. Cathy Hackl is an Emmy-nominated communicator turned virtual reality & augmented reality, producer, speaker and futuristic content creator. Hackl is the host of the Augmented and Virtual Reality Marketing Podcast and #VRARChat. She's also the founder of Latinos in VR/AR and one of the women leading the virtual revolution. Cathy was named by Onalytica as a leading augmented reality influencer and also by NBC News as one of the top Latina women working in virtual reality. Before working in VR and social media, she worked as a journalist for CNN, Discovery Communications, and ABC News. She loves all things mixed reality, tech, AI, drones and robots. product line for men & women and manages social media and marketing for companies and brands. Ronaldo Linares is a chef, media influencer, and author of "Sabores de Cuba" Diabetes Friendly Traditional and Nueva Cubano Cuisine. Established as America's leading expert on healthy Latino cooking focused in social change, Ronaldo has showcased his culinary style on Food Network’s Chopped, BBC America’s Cross-Country chef competition “Chef Race,” and has made appearances on WNBC, Fox News, and Telemundo. He is a popular featured chef at live events including the Food Network’s “Food & Wine Festival,” Diabetes Expo, The International Restaurant and Food Service Show, and more. 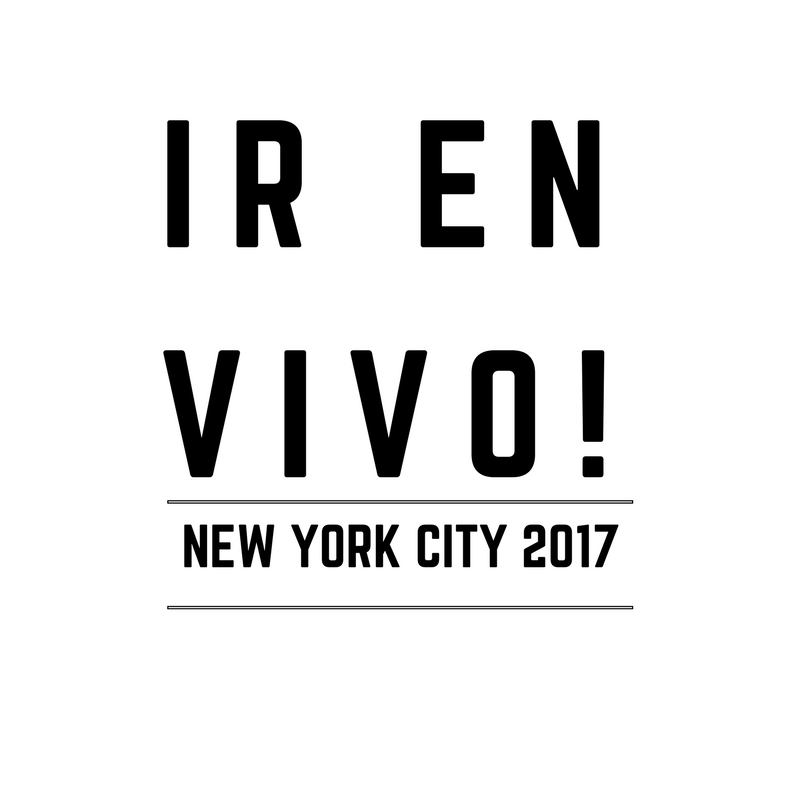 *Ronaldo will be hosting a book signing at IR EN VIVO! at 1PM. Mr. Torres is a wandering digital nomad with a passion for tech, travel, speaking, teaching & community building in the LatinX community .In 1997, Mr. Torres is the founder of Sofrito Media Group. The company is a multi-media company located in Brooklyn, NY that manages and produces branded projects that appeal to the Latino / Hispanic segment. These projects include web properties, live events, social media campaigns, internet radio production, content development and consulting services. Chase Muratore has roots as a door to door salesman with two nightmares. #1 doing sales for a living, and #2 becoming his father (not such a bad thing it turns out). The irony of where we begin and where we journey to is a major influence in his writing. This combined with a business background that has laid the groundwork for a strategic and influential vantage point has allowed Chase to create films and V.R. experiences that people not only enjoy, but desire. Currently Chase has written and produced "A Happy Divorce" with Cannes award winning director Jamal Hodge, and is in V.R. production of "Bluff V.R." as well as Pierre the Pigeon Hawk. Gerald Cruz Fernando is the creator of THE GERALD FACTOR, a new YouTube talk and variety show which chronicles his love for film, theater, nightlife, and his unique close encounters with celebrities -- shot "on-the-go" style with his handheld camera in selfie mode. Gerald has lived and breathed talk shows for over ten years, connecting fans to their favorite shows as the Audience Coordinator on The View, Good Morning America, The Morning Show with Mike and Juliet, Anderson Live, and Mario Armstrong's Never Settle Show. Dr. Goldstein is a world-renowned dermatologist who first developed sunscreen and many of the procedures for tattoo removal and he remains a leading practitioner in that specialty, having trained hundreds of physicians from around the globe. Marek Alexander Radin is an Actor, Cinematographer, and a YouTube Personality. He's known for film work on First We Take Brooklyn 2016, The Story of Us 2016, and Nefertitty 2017. Starting his YouTube channel in 2011, Rodriguez has built a mass following of middle school and high school teens looking for advice in different areas of their life: self-worth, relationships, academics, and family. Josh is also the digital media specialist at Hapara, designing digital media campaigns for teachers and school leaders in the education technology space. Jamal Hodge is a director and writer, known for films Knockout Game (2017), A Happy Divorce ( 2017) The Jump (2016) and The Kind Ones (2016). Jonathan Bator has close to a decade of production experience. He’s acted in Time, which won Best Feature at the Philadelphia International Film Festival. He additionally directed a music video, “Two Left Feet” which won video of the year on the Independent Music Video Network and is currently marketing a feature length screenplay to studios in Los Angeles. Protecting intellectual property assets is Elizabeth’s first priority. Elizabeth counsels business owners, inventors and entrepreneurs in protecting and enforcing their intellectual property assets. As a Registered Patent Attorney, she practices in many areas of intellectual property law, including patent and trademark prosecution, enforcement and litigation, licensing, copyright enforcement and litigation, and patent litigation. Featherman also serves as a board member at the Exceptional Artists Foundation and the Asian American Women Coalition. Michelle is a Brand Ambassador, social media maven, workaholic, technology enthusiast and Loving Momi that was inspired by her daughters to live life and learn to smell the roses. This past summer Martin and daughters made the decision to start a blog that would chronicle everything they love. Working with her girls, Gigi and Giselle, to put this blog together in hopes that it may inspire YOU. IMarilyn Zayfert is the president of illumiNET Media, which she founded in 2009 after observing the broad reach of social media. Marilyn’s desire to help her community has led to a number of projects with non-profit organizations on Staten Island. Marilyn has been a Board Member of the Office of Jewish Community affairs, Jewish Outreach Institute, The National Lighthouse Museum, and the Educational Theater Group IlluminArt Productions. Marilyn is also the founder and curator of the online blog Staten Island NYC Living. She lives in the Lighthouse Hill area.